When I want to treat myself or celebrate a special occasion, one of the places I like to go is Pascal’s This restaurant is considered upscale for Greenwood. They serve French-American style cuisine. Reservations are recommended to make sure you get a table in this small restaurant because they tend to get crowded. Some people have told me that they consider Pascal’s to be pricey, but I have been to other upscale restaurants and their prices are about par for what I expect. That being said, do not try to eat here if you are on a budget because plates average prices are probably about $20. I am not very adventurous when it comes to trying different plates on their menu because I love the pork osso bucco. The meat is so tender that it falls off the bone. The rosemary demi-glace sauce is a wonderful complement to the mashed potatoes. And the asparagus qualifies as my serving of vegetables for the day because it is served al dente without having the life cooked out of it. I do not know how many pork osso bucco Pascal cooks each night, but I always try to get there early so that I can get my order before they run out for the night. Pork osso bucco is so delicious that even after I am full, I might try to eat a little more. 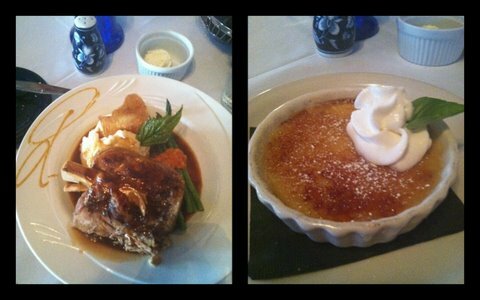 The only thing that keeps me from stuffing myself is the knowledge that I will be able to eat Crème Brulée for dessert. Pascal’s Crème Brulée rivals Maggianos. I love the textural differences of the crunch of the burnt, slightly bitter caramelized sugar mixed with the soft, sweet, creamy, vanilla custard. It is like velvet in my mouth. Overall: The service is good. I have never had a problem with any of the waitstaff. The quality of the pork osso bucco and Crème Brulée has always been top notch for me too.